When the Liberal government announced that they were going to legalize weed, I thought that meant growing thistles and dandelions was going to be the “in thing.” You know, kind of how Prime Minister Trudeau has made doing yoga poses on board tables cool. Except the only yoga pose I’ve ever perfected is corpse pose. Don’t worry. I have thistles and quack grass, too. And other weeds I call Generic. Strategy 1 (c. 2005): Contemplate hiring the big guns. My only experience with weeds up until that point was from my childhood, spent on a grain farm in Manitoba. When weeds were sewing their wild oats in a section of wheat, a crop duster flew over, dodged power lines, and took care of the weeds. 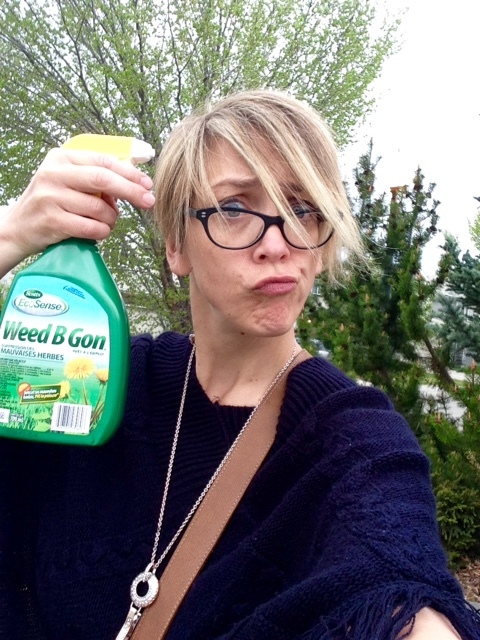 My time in Calgary has taught me that airplanes carpet bombing weeds are frowned upon in suburbia. Strategy 2 (c. 2005-2006): Ignore. This strategy worked for the first year. The woman we bought the house from was a horticulturalist. Our yard was weed free! Until year two. Strategy 3 (c. 2006): Get my husband to do it. After a year of untended weeds, they flourished like Donald Trump in 2016 America. My husband decided to “take care of” our street-facing flowerbed. It was April, and he pulled the weeds. And nearly all of the perennials. So, do you have weeds in your lawn? 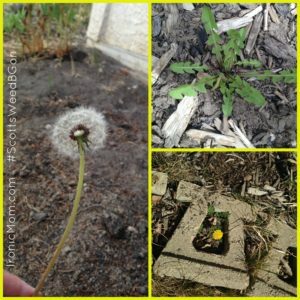 Is there a Dandelion Seed Factory in your neighbourhood? If there is and you share a photograph of weeds in your yard, nine people will receive a coupon for $5 off Weed B Gon®. Coupons means saved money, which means more money for wine (and maybe even Advil), followed by corpse pose, of course. And while you’re at it, follow the #ScottsWeedBGon challenge. I’ll make you laugh. Mostly at me, sometimes at my husband. Full disclosure (which is different from a full-frontal disclosure, in case you were wondering): The Scotts® Miracle-Gro Company has compensated me to write about their products, which will help cover some of my blog hosting costs. All opinions, dead grass, and weeds are my own.